Kim Il-sung (officially transcribed Kim Il Sung; English pronunciation: /ˈkɪmˈɪlˈsʌŋ, -ˈsʊŋ/ ;  Chosŏn'gŭl : 김일성; Korean pronunciation: [kimils͈ʌŋ] ; born Kim Sŏng-ju (김성주); 15 April 1912 – 8 July 1994) was the first leader of North Korea which he ruled from the country's establishment in 1948 until his death in 1994. He held the posts of Premier from 1948 to 1972 and President from 1972 to 1994. 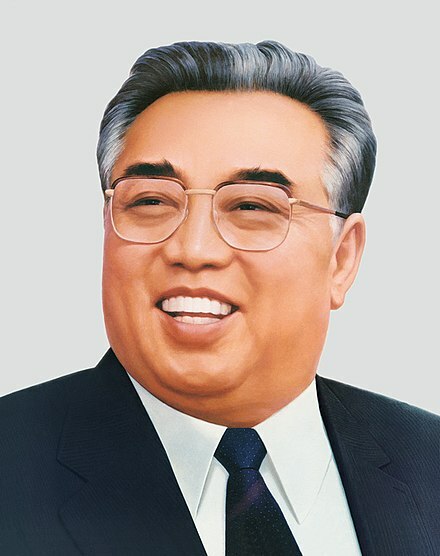 He was also the leader of the Workers' Party of Korea (WPK) from 1949 to 1994 (titled as Chairman from 1949 to 1966 and as General Secretary after 1966). Coming to power after the end of Japanese rule in 1945, he authorized the invasion of South Korea in 1950, triggering an intervention in defense of South Korea by the United Nations led by the United States. Following the military stalemate in the Korean War, a ceasefire was signed on 27 July 1953. He was the second longest-serving non-royal head of state/government in the 20th century, in office for more than 48 years. Transcription in the linguistic sense is the systematic representation of language in written form. The source can either be utterances or preexisting text in another writing system. Under his leadership, North Korea became a communist state with a publicly owned and planned economy. It had close political and economic relations with the Soviet Union. By the 1960s, North Korea enjoyed a standard of living higher than the South, which was fraught with political instability and economic crises. The situation reversed in the mid-1970s, as a newly stable South Korea became an economic powerhouse fueled by Japanese and American investment, military aid and internal economic development while North Korea stagnated. Differences emerged between North Korea and the Soviet Union, central among them Kim Il-sung's philosophy of Juche , which focused on Korean nationalism and self-reliance. Despite this, the country received funds, subsidies and aid from the USSR (and the Eastern Bloc) until the dissolution of the USSR in 1991. The resulting loss of economic aid adversely affected the North's economy, causing widespread famine in 1994. During this period, North Korea also remained critical of the United States defense force's presence in the region, which it considered imperialism, having seized the American ship USS Pueblo (AGER-2) in 1968. He outlived Joseph Stalin by four decades and Mao Zedong by almost two and remained in power during the terms of office of six South Korean Presidents, ten U.S. Presidents and the rule of British monarchs George VI and later his daughter Elizabeth II. Known as the Great Leader (Suryong), he was the focus of a personality cult which dominated domestic politics in North Korea. The economy of North Korea is a centrally planned system, where the role of market allocation schemes is limited, though increasing. As of 2015 North Korea continues its basic adherence to a centrally planned command economy. There has been some economic liberalization, particularly after Kim Jong-un assumed the leadership in 2012, but reports conflict over particular legislation and enactment. The 6th Congress of the Workers' Party of Korea (WPK) was held in the February 8 House of Culture in Pyongyang, North Korea, from 10–14 October 1980. The congress is the highest organ of the party, and is stipulated to be held every four years. 3,062 delegates represented the party's membership; 117 foreign delegates attended the congress, without the right to speak. The congress saw the reappointment of Kim Il-sung as WPK General Secretary and the Presidium of the Politburo established as the highest organ of the party between congresses. Kim Kyung-chon was a Korean independence activist and military leader. Several sources believe North Korean leader Kim Il-sung stole his identity after his death. In 1888, he was born in a rich, Yangban-traditioned family in South Hamgyong Province, Pukchong County, as the fifth son of his father Kim Ding-Hyung. His original name was Kim Ung-chon. In 1909 he married You Jong. He later entered the Imperial Japanese Army Academy and graduated in 1911, attaing the rank of cavalry lieutenant in the Imperial Japanese Army. In June 1919 he fled to Manchuria along with Chi Chong-chon to join the Korean independence movement, working as a trainer but after only six months he communicated with some Korean activists and moved to Vladivostok to fight under Kim Kyu, who was renowned for victory over a Japanese battalion. His main operation after arriving in Vladivostok was fighting off Japanese-supported Chinese militias. In this period he chose Kim Kyung-cheon as a pseudonym. During the Russian Civil War, his troops managed to impress Red Army commanders with good discipline. In January 1923 he attended the conference of Korean Provisional Government in Shanghai and decided to create a communist Korean regime which would be based in the Soviet Union. However, the Comintern denied the "republic's" legitimacy as an independent entity, leading Ji to leave the Soviet Union while Kim remained. During the Great Purge, Kim was arrested for protesting against Joseph Stalin's Korean Dislocation policy and eventually died in a Soviet prison. He and Ji Cheong-cheon and Shin Dong-cheon were called "3 cheons of South Manchuria" (南满三天). He was also referred to as 擎天金将軍 by Koreans in Manchuria. Andrei Nikolaevich Lankov is a Russian scholar of Asia and a specialist in Korean studies and Director of Korea Risk Group, the parent company of NK News and NK Pro. Zhou Baozhong was a commander of the Northeast Anti-Japanese United Army resisting the pacification of Manchukuo by the Empire of Japan. Kim Hyŏng-jik was a Korean independence activist. He was the father of North Korean founder Kim Il-sung, grandfather of Kim Jong-il, and great-grandfather of the current leader of North Korea, Kim Jong-un. 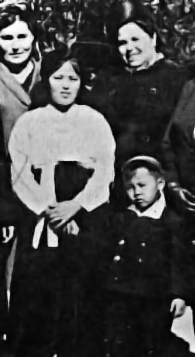 Kang Pan-sŏk was the mother of North Korean leader Kim Il-sung, grandmother of the late leader of North Korea, Kim Jong-il, and great-grandmother of the current leader of North Korea, Kim Jong-un. She was a Korean independence activist and communist politician. April 21 is a day of memorial for her in North Korea, when a wreath-laying ceremony is held at Chilgol Revolutionary Site, in what was Chilgol-ri, a town once in Pyongang Province and today part of Pyongyang. Jeonju is the 16th largest city in South Korea and the capital of North Jeolla Province. It is both urban and rural due to the closeness of Wanju County which almost entirely surrounds Jeonju. The name Jeonju literally means "Perfect Region". It is an important tourist center famous for Korean food, historic buildings, sports activities, and innovative festivals. North Jeolla Province or Jeollabuk-do is a province in the southwest of South Korea. The province was formed in 1896 from the northern half of the former Jeolla province, and remained a province of Korea until the country's division in 1945, then became part of South Korea. 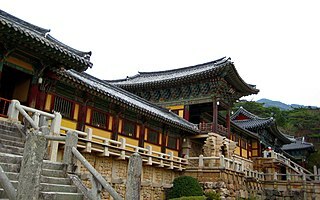 The provincial capital is Jeonju, which was the capital of all of Jeolla before 1896. Man'gyŏngdae-guyŏk or Man'gyŏngdae District (Chosŏn'gŭl: 만경대구역) is one of the 19 guyŏk (wards) that constitute P'yŏngyang, North Korea. It began as a village, Man'gyŏngdae-ri, South P'yŏngan Province and became a district of P'yŏngyang in September 1959. The area is surrounded by several hills, the highest one named Man'gyŏng Hill because one can enjoy a bird's-eye view of the surrounding scenic landscape, and the village at its foot is called Man'gyŏngdae. Man'gyŏngdae was the birthplace of North Korean leader Kim Il-sung. According to Kim, his family was not very poor, but was always a step away from poverty. Kim said that he was raised in a Presbyterian family, that his maternal grandfather was a Protestant minister, that his father had gone to a missionary school and was an elder in the Presbyterian Church, and that his parents were very active in the religious community. According to the official version, Kim’s family participated in anti-Japanese activities and in 1920 they fled to Manchuria. Like most Korean families, they resented the Japanese occupation of the Korean peninsula, which began on 29 August 1910.  :12 Another view seems to be that his family settled in Manchuria, as many Koreans had at the time to escape famine. Nonetheless, Kim's parents, especially Kim's mother Kang Ban Suk, played a role in the anti-Japanese struggle that was sweeping the peninsula. :16 Their exact involvement—whether their cause was missionary, nationalist, or both—is unclear nevertheless. :53 Still, Japanese repression of opposition was brutal, resulting in the arrest and detention of more than 52,000 Korean citizens in 1912 alone. :13 This repression forced many Korean families to flee Korea and settle in Manchuria. In 1935 Kim took the name Kim Il-sung, meaning "Kim become the sun". :30 Kim was appointed commander of the 6th division in 1937, at the age of 24, controlling a few hundred men in a group that came to be known as "Kim Il-sung's division". While commanding this division he executed a raid on Poch’onbo, on 4 June 1937. Although Kim's division only captured the small Japanese-held town just within the Korean border for a few hours, it was nonetheless considered[ by whom? ] a military success at this time, when the guerrilla units had experienced difficulty in capturing any enemy territory. This accomplishment would grant Kim some measure of fame among Chinese guerrillas, and North Korean biographies would later exploit it as a great victory for Korea. For their part the Japanese regarded Kim as one of the most effective and popular Korean guerrilla leaders. :160–161  He appeared on Japanese wanted lists as the "Tiger". The Japanese "Maeda Unit" was sent to hunt him in February 1940. Later in 1940, the Japanese kidnapped a woman named Kim Hye-sun, believed to have been Kim Il Sung's first wife. After using her as a hostage to try to convince the Korean guerrillas to surrender, but to no avail, she was killed. Kim was appointed commander of the 2nd operational region for the 1st Army, but by the end of 1940 he was the only 1st Army leader still alive. Pursued by Japanese troops, Kim and what remained of his army escaped by crossing the Amur River into the Soviet Union. :53–54 Kim was sent to a camp at Vyatskoye near Khabarovsk, where the Soviets retrained the Korean Communist guerrillas. Kim became a Major in the Soviet Red Army and served in it until the end of World War II in 1945. 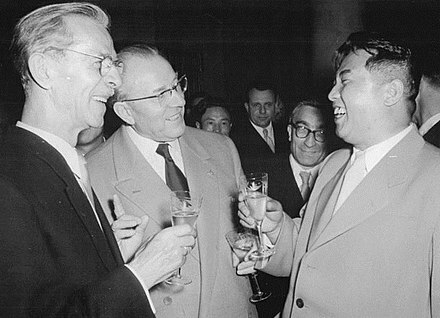 However, Albania's Enver Hoxha (another independent-minded Communist leader) was a fierce enemy of the country and Kim Il sung, writing in June 1977 that "genuine Marxist-Leninists" will understand that the "ideology is guiding the Korean Workers' Party and the Communist Party of China...is revisionist" and adding later that month that "in Pyongyang, I believe that even Tito will be astonished at the proportions of the cult of his host [Kim Il Sung], which has reached a level unheard of anywhere else, either in past or present times, let alone in a country which calls itself socialist. He further claimed that "the leadership of the Communist Party of China has betrayed [the working people]. In Korea, too, we can say that the leadership of the Korean Workers' Party is wallowing in the same waters" and claimed that Kim Il Sung was begging for aid from other countries, especially among the Eastern Bloc and non-aligned countries like Yugoslavia. 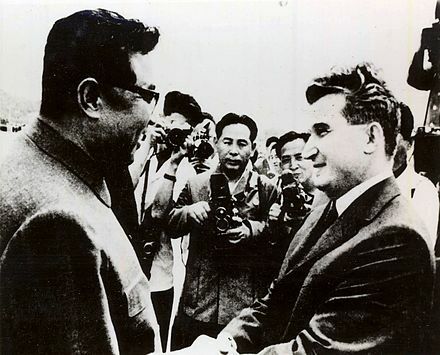 As a result, relations between North Korea and Albania would remain cold and tense right up until Hoxha's death in 1985. Although a resolute anti-communist, Zaire's Mobutu Sese Seko was also heavily influenced by Kim's style of rule. At the same time, Kim was establishing an extensive personality cult. 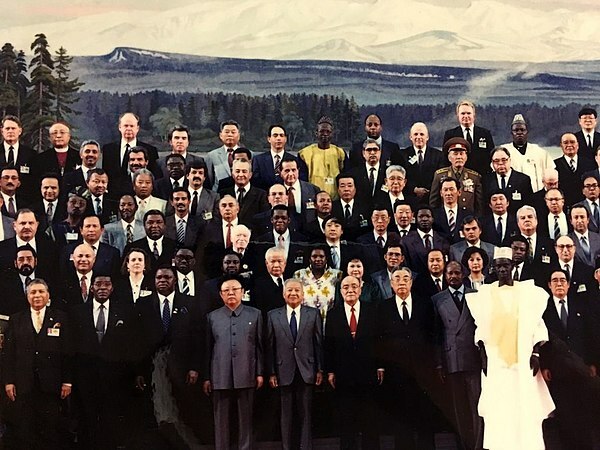 North Koreans were taught that Kim was the "Sun of the Nation" and could do no wrong. Kim developed the policy and ideology of Juche in opposition to the idea of North Korea as a satellite state of China or the Soviet Union. The history of North Korea began at the end of World War II in 1945. The surrender of Japan led to the division of Korea at the 38th parallel, with the Soviet Union occupying the north, and the United States occupying the south. 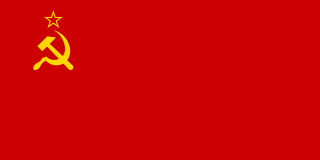 The Soviet Union and the United States failed to agree on a way to unify the country, and in 1948 they established two separate governments – the Communist-aligned Democratic People's Republic of Korea and the Western-aligned Republic of Korea – each claiming to be the legitimate government of all of Korea. 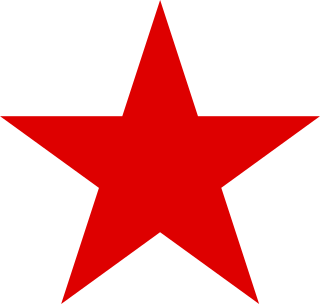 Juche is the official state ideology of North Korea, described by the government as "Kim Il-sung's original, brilliant and revolutionary contribution to national and international thought". It postulates that "man is the master of his destiny", that the Korean masses are to act as the "masters of the revolution and construction" and that by becoming self-reliant and strong a nation can achieve true socialism. Kim Il-sung University, founded on 1 October 1946, is the first university built in North Korea. It is located on a 15-hectare campus in Pyongyang, the nation's capital. Along with the main academic buildings, the campus contains 10 separate offices, 50 laboratories, libraries, museums, a printing press, an R&D centre, dormitories and a hospital. There is a sizeable computer lab, but it has only limited internet access. The university is named in honour of Kim Il-sung, the founder and first leader of North Korea. Courses in both the department of social sciences and the department of natural sciences take five years to complete. Kim Jong-suk was a Korean anti-Japanese guerrilla, a Communist activist, North Korean leader Kim Il-sung’s second wife, former leader Kim Jong-il’s mother, and current leader Kim Jong-un's grandmother. Choe Yong-gon was the Supreme Commander of the Korean People's Army from 1948 to 1950, North Korean defence minister from 1948 to 1957, and the Chairman of the Presidium of the Supreme People's Assembly of North Korea from 1957 to 1972. Songun is the "military first" policy of North Korea, prioritizing the Korean People's Army in the affairs of state and allocation of resources. "Military first" as a principle guides political and economic life in North Korea, with "military-first politics" dominating the political system; "a line of military-first economic construction" acting as an economic system; and "military-first ideology" serving as the guiding ideology. The Communist movement in Korea emerged as a political movement in the early 20th century. Although the movement had a minor role in pre-war politics, the division between the communist North Korea and the anti-communist South Korea came to dominate Korean political life in the post-World War II era. 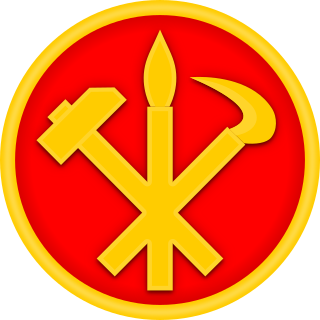 North Korea, officially the Democratic People's Republic of Korea, continues to be a Juche socialist state under the rule of the Workers' Party of Korea. In South Korea, communism remains illegal through the National Security Law. Due to end of economic aid from Soviet Union after its dissolution in 1991 and impractical ideological application of Stalinist policies in North Korea over years of economic slowdown in 1980s and receding during 1990s, North Korea replaced Communism with Juche ideology in its 1992 and 1998 constitutional revisions for the personality cult of Kim's family dictatorship and opening of North Korean market economy reform, though it still retains a command economy with complete state control of industry and agriculture with collectivized farms and state-funded education and healthcare. Kim Il-sung Square is a large city square in the Central District of Pyongyang, North Korea, and is named after the country's founding leader, Kim Il-sung. The square was constructed in 1954 according to a master plan for reconstructing the capital after the destruction of the Korean War. It was opened in August 1954. The square is located on the foot of the Namsan Hill, west bank of the Taedong River, directly opposite the Juche Tower on the other side of the river. It is the 37th largest square in the world, having an area of about 75,000 square meters which can accommodate a rally of more than 100,000 people. The square has a great cultural significance, as it is a common gathering place for rallies, dances and military parades and is often featured in media concerning North Korea. Korean revolutionary opera is a tradition of revolutionary opera in North Korea based on that of China during the Cultural Revolution. It is characterized by a highly melodramatic style and reoccurring themes of Korean nationalism and glorification of Juche, the Kim dynasty, and the working people, as well as a focus on socialist realist themes. Composers of North Korean revolutionary opera are employed by the North Korean government and the fundamental principles of North Korean revolutionary opera were dictated by Kim Jong-Il in his speech On the Art of Opera. The North Korean cult of personality surrounding its ruling family, the Kim family, has existed in North Korea for decades and can be found in many examples of North Korean culture. Although not acknowledged by the North Korean government, many defectors and Western visitors state there are often stiff penalties for those who criticize or do not show "proper" respect for the regime. 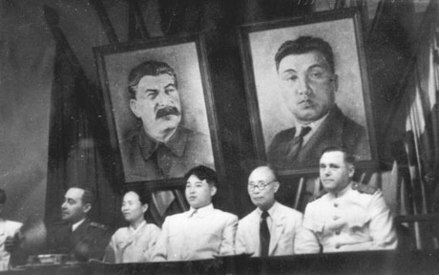 The personality cult began soon after Kim Il-sung took power in 1948, and was greatly expanded after his death in 1994. Reminiscences: With the Century is the autobiography of Kim Il-sung, founder and president of North Korea. The memoirs, written in 1992 and published in eight volumes, retell Kim's life story through his childhood to the time of Korean resistance. Initially, a total of 30 volumes were planned but Kim Il-sung died in 1994 after just six volumes; the seventh and eight volumes were published posthumously. The work reveals early influences of religious and literary ideas on Kim's thinking. An important part of North Korean literature, With the Century is held as a valuable if somewhat unreliable insight into the nation's modern history under late colonial Korea. The book is considered one of a few North Korean primary sources widely available in the West and as notable research material for North Korean studies. The Battle of Pochonbo was an event which occurred in northern Korea on 4 June 1937, when Korean and Chinese guerrillas commanded by Kim Il-sung attacked and defeated a Japanese detachement during the anti-Japanese armed struggle in Korea. The battle holds an important place in North Korean narratives of history. On the Juche Idea: Treatise Sent to the National Seminar on the Juche Idea Held to Mark the 70th Birthday of the Great Leader Comrade Kim Il Sung, 31 March 1982 is a treatise attributed to North Korean leader Kim Jong-il on the North Korean Juche ideology. It is considered the most authoritative work on Juche. 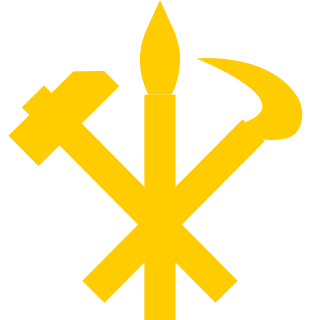 The Propaganda and Agitation Department, officially the Publicity and Information Department, is a department of the Central Committee of the Workers' Party of Korea (WPK) tasked with coordinating the creation and dissemination of propaganda in North Korea. It is the highest propaganda organization in the country. 1 2 Cumings, Bruce (2003). North Korea: Another Country. New York: New Press. ISBN 978-1-56584-940-2. ↑ "NK founder's second wife died in 2014: Unification Ministry". www.koreaherald.com. 27 December 2018. ↑ "Kim Il Sung". American Heritage Dictionary of the English Language (Fifth ed.). n.d. Retrieved 6 March 2017. ↑ Buzo, Adrian (2002). The Making of Modern Korea. London: Routledge. p. 140. ISBN 978-0-415-23749-9. ↑ Cumings, Bruce (2005). Korea's Place in the Sun: A Modern History. New York: W. W. Norton & Company. p. 434. ISBN 978-0-393-32702-1. ↑ Robinson, Michael E (2007). Korea's Twentieth-Century Odyssey. Honolulu: University of Hawaii Press. p. 153. ISBN 978-0-8248-3174-5. ↑ Bluth, Christoph (2008). Korea. Cambridge: Polity Press. p. 34. ISBN 978-07456-3357-2. ↑ Black Book of Communism , pg. 564. ↑ The Worst of the Worst: The World's Most Repressive Societies Archived June 7, 2013, at the Wayback Machine . Freedom House, 2012. 1 2 3 4 5 Jasper Becker (1 May 2005). Rogue Regime : Kim Jong Il and the Looming Threat of North Korea. Oxford University Press. ISBN 978-0-19-803810-8. Archived from the original on 18 May 2016. ↑ "Soviets groomed Kim Il Sung for leadership". Vladivostok News. 10 January 2003. Archived from the original on 10 June 2009. 1 2 3 4 5 Lankov, Andrei (2002). From Stalin to Kim Il Sung: The Formation of North Korea 1945–1960. Rutgers University Press. ISBN 978-0813531175. 1 2 Cumings, Bruce (17 September 2005). Korea's Place in the Sun: A Modern History (Updated). New York: W W Norton & Co. ISBN 978-0-393-32702-1. Archived from the original on 18 May 2016. ↑ Buzo, Adrian (2002). The Making of Modern Korea. London: Routledge. p. 56. ISBN 978-0-415-23749-9. ↑ Robinson, Michael E (2007). Korea's Twentieth-Century Odyssey. Honolulu: University of Hawaii Press. p. 87. ISBN 978-0-8248-3174-5. ↑ Oberdorfer, Don; Carlin, Robert (2014). The Two Koreas: A Contemporary History. Basic Books. pp. 13–14. ISBN 9780465031238. 1 2 Kim Il-sung (1994). With the Century (PDF). 2. Pyongyang: Foreign Languages Publishing House. OCLC 28377167 . Retrieved 17 October 2014. 1 2 3 4 5 Baik Bong (1973). Kim il Sung: Volume I: From Birth to Triumphant Return to Homeland. Beirut, Lebanon: Dar Al-talia. 1 2 "Soviet Officer Reveals Secrets of Mangyongdae". Daily NK. 2014-01-02. Archived from the original on 11 February 2014. Retrieved 15 April 2014. ↑ "PETER HITCHENS: North Korea, the last great Marxist bastion, is a real-life Truman show". Daily Mail. London. 8 October 2007. Archived from the original on 23 July 2012. ↑ Byrnes, Sholto (7 May 2010). "The Rage Against God, By Peter Hitchens". The Independent. London. Archived from the original on 12 May 2010. ↑ Smith, Lydia (2014-07-08). "Kim Il-sung Death Anniversary: How the North Korea Founder Created a Cult of Personality". International Business Times UK. Archived from the original on 6 October 2014. Retrieved 2014-10-01. ↑ Sang-Hun, Choe; Lafraniere, Sharon (27 August 2010). "Carter Wins Release of American in North Korea". The New York Times. Archived from the original on 30 June 2017. ↑ Suh Dae-Sook, Kim Il Sung: The North Korean Leader, Columbia University Press (1998) p. 7. ↑ Kim Il-Sung, "Let Us Repudiate the 'Left' Adventurist Line and Follow the Revolutionary Organizational Line" contained in On Juche in Our Revolution (Foreign Languages Publishers: Pyongyang, Korea, 1973)3. ↑ Yamamuro, Shin'ichi (2006). Manchuria Under Japanese Dominion. ISBN 9780812239126. Archived from the original on 18 May 2016. Retrieved February 8, 2016. ↑ Kim Il-Sung, "Let Us Repudiate the 'Left' Adventurist Line and Follow the Revolutionary Organizational Line" contained in On Juche in Our Revolution, pp.1-15. ↑ Kim Il-Sung, "On Waging Armed Struggle Against Japanese Imperialism" on 16 December 1931 contained in On Juche in Our Revolution, pp. 17-20. 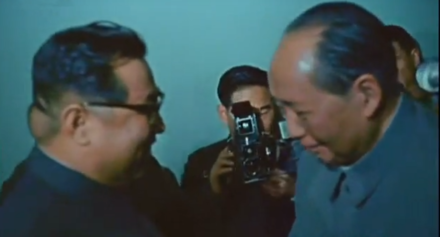 ↑ Suh Dae-Sook, Kim Il Sung: The North Korean Leader, Columbia University Press (1998) pp. 8–10. 1 2 3 4 Bradley K. Martin (2004). Under the Loving Care of the Fatherly Leader: North Korea and the Kim Dynasty. Thomas Dunne Books. ISBN 978-0-312-32322-6. ↑ Robinson, Michael E (2007). Korea's Twentieth-Century Odyssey. Honolulu: University of Hawaii Press. pp. 87, 155. ISBN 978-0-8248-3174-5. 1 2 Lone, Stewart; McCormack, Gavan (1993). Korea since 1850. Melbourne: Longman Cheshire. p. 100. 1 2 Mark O'Neill. "Kim Il-sung's secret history | South China Morning Post". Scmp.com. Archived from the original on 27 February 2014. Retrieved 2014-04-15. 1 2 Armstrong, Charles (2013-04-15). The North Korean Revolution, 1945–1950. Cornell University Press. 1 2 Lankov, Andrei (2012-01-25). "Terenti Shtykov: the other ruler of nascent N. Korea". The Korea Times . Archived from the original on 17 April 2015. Retrieved April 14, 2015. ↑ Behnke, Alison (2012-08-01). Kim Jong Il's North Korea. ISBN 9781467703550. ↑ Mossman, Billy (June 29, 2005). United States Army in the Korean War: Ebb and Flow November 1950-July 1951. University Press of the Pacific. p. 51. ↑ Sandler, Stanley (1999). The Korean War: No Victors, No Vanquished. The University Press of Kentucky. p. 108. 1 2 David Halberstam. Halberstam, David (25 September 2007). The Coldest Winter: America and the Korean War. Hyperion. Kindle Edition. ↑ Bethany Lacina and Nils Petter Gleditsch, Monitoring Trends in Global Combat: A New Dataset of Battle Deaths Archived 12 October 2013 at the Wayback Machine , European Journal of Population (2005) 21: 145–166. ↑ "25 October 1950". teachingamericanhistory.org. ↑ Timothy Hildebrandt, "Uneasy Allies: Fifty Years of China-North Korea Relations" Archived 24 February 2015 at the Wayback Machine , Asia Program Special Report, September 2003, Woodrow Wilson International Centre for Scholars. ↑ Chung, Chin O. Pyongyang Between Peking and Moscow: North Korea’s Involvement in the Sino-Soviet Dispute, 1958-1975. University of Alabama. 1978. ↑ French, Paul. North Korea: State of Paranoia. New York: St. Martin’s Press. 2014. 1 2 Chung, Chin O. Pyongyang Between Peking and Moscow: North Korea’s Involvement in the Sino-Soviet Dispute, 1958-1975. University of Alabama, 1978, p. 45. 1 2 Kim Young Kun; Zagoria, Donald S. (December 1975). "North Korea and the Major Powers". Asian Survey. 15 (12): 1017–1035. doi:10.2307/2643582. JSTOR 2643582. ↑ Behr, Edward Kiss the Hand You Cannot Bite, New York: Villard Books, 1991 page 195. ↑ Enver Hoxha, "Reflections on China II: Extracts from the Political Diary", Institute of Marxist-Leninist Studies at the Central Committee of the Party of Labour of Albania," Tirana, 1979, pp 516, 517, 521, 547, 548, 549. ↑ Radio Free Europe/Radio Liberty Research 17 December 1979 quoting Hoxha's Reflections on China Volume II: "In Pyongyang, I believe that even Tito will be astonished at the proportions of the cult of his host, which has reached a level unheard of anywhere else, either in past or present times, let alone in a country which calls itself socialist." "Albanian Leader's 'Reflections on China,' Volume II". CEU.hu. Archived from the original on 8 September 2009. Retrieved 2008-10-30. ↑ Howard W. French, With Rebel Gains and Mobutu in France, Nation Is in Effect Without a Government Archived 30 June 2017 at the Wayback Machine , The New York Times (17 March 1997). 1 2 3 4 Lankov, Andrei (2015). The Real North Korea: Life and Politics in the Failed Stalinist Utopia. Oxford: Oxford University Press. ISBN 978-0-19-939003-8. ↑ "DPR Korea", Official site, Asia–Pacific Legal Metrology Forum, 2015, archived from the original on 9 February 2017 . ↑ Haberman, Clyde; Times, Special to The New York (1986-11-17). "Kim Il Sung, at 74, Is Reported Dead". The New York Times. Archived from the original on 19 March 2017. Retrieved 2017-03-19. ↑ Saxonberg, Steven (14 February 2013). Transitions and Non-Transitions from Communism: Regime Survival in China, Cuba, North Korea, and Vietnam. Cambridge University Press. p. 123. ISBN 978-1-107-02388-8. Archived from the original on 18 May 2016. ↑ Henry, Terrence (2005-05-01). "After Kim Jong Il". The Atlantic . Retrieved 2014-10-01. 1 2 Portal, Jane; British Museum (2005). Art under control in North Korea. Reaktion Books. p. 82. ISBN 978-1-86189-236-2. ↑ "The Chosun Ilbo (English Edition): Daily News from Korea - N.Korean Dynasty's Authority Challenged". English.chosun.com. 2012-02-13. Archived from the original on 29 September 2012. Retrieved 2012-11-09. ↑ "Controversy Stirs Over Kim Monument at PUST" NK Daily. Archived 12 April 2010 at the Wayback Machine . Retrieved 24 April 2010. ↑ "North Korean museum shows off leaders' gifts". The Age . Reuters. December 21, 2006. ↑ Birthday of Kim Il-sung. Holidays, Festivals, and Celebrations of the World Dictionary (Fourth ed.). Omnigraphics. 2010. Retrieved 3 May 2015– via TheFreeDictionary.com. ↑ Choi Song Min (16 April 2013). "Spring Art Festival Off the Schedule". DailyNK. Archived from the original on 13 March 2015. Retrieved 3 May 2015. ↑ Jo Am; An Chol-gang, eds. (2002). "The Foreign Orders and Honorary Titles Awarded to President Kim Il Sung". Korea in the 20th Century: 100 Significant Events. Translated by Kim Yong-nam; Kim Kyong-il; Kim Jong-shm. Pyongyang: Foreign Languages Publishing House. p. 162. OCLC 276996886. ↑ Westad, Odd Arne (2017). The Cold War: A World History. New York: Basic Books. p. 190. ISBN 978-0-465-09313-7. 1 2 3 "Kim Il Sung". Who's Who in Asian and Australasian Politics. London: Bowker-Saur. 1991. p. 146. ISBN 978-0-86291-593-3. ↑ "Řád Klementa Gottwalda: za budování socialistické vlasti" (PDF) (in Czech). Archiv Kanceláře Prezidenta Republiky. 17 January 2015. p. 11. Retrieved 21 June 2018. ↑ News from Hsinhua News Agency: Daily Bulletin. London: Xin hua tong xun she. 1 October 1965. p. 53. OCLC 300956682. ↑ Summary of World Broadcasts: Far East, Part 3. Reading: Monitoring Service of the British Broadcasting Corporation. 1985. OCLC 976978783. ↑ Sanders, Alan J. K. (2010). "Orders and medals". Historical Dictionary of Mongolia (Third ed.). Lanham: Scarecrow Press. p. 551. ISBN 978-0-8108-7452-7. ↑ "Gifts of World People". Korea Today. No. 304–315. Pyongyang: Foreign Languages Publishing House. 1982. p. 58. ISSN 0454-4072. ↑ "Immortal classical works written by President Kim Il Sung". Naenara . May 2008. Retrieved 2015-01-16. ↑ ""Complete Collection of Kim Il Sung's Works" Off Press". KCNA . January 18, 2012. Archived from the original on 12 October 2014. Retrieved January 16, 2015. ↑ Suk-Yong Kim (2018). "Dead Father's Living Body: Kim Il-sung's Seed Theory and North Korean Arts". In Kaminskij, Konstantin; Koschorke, Albrecht. Tyrants Writing Poetry. Budapest: Central European University Press. p. 159. ISBN 978-963-386-202-5. Kracht, Christian, The Ministry Of Truth: Kim Jong Il's North Korea , Feral House, October 2007, 132 pages, 88 color photographs, ISBN 978-1-932595-27-7. Lee Chong-sik. "Kim Il-Song of North Korea." Asian Survey . University of California Press. Vol. 7, No. 6, June 1967. DOI 10.2307/2642612. Available at Jstor.